This carrot-based soup is suitable for vegetarians and adds cashews for protein and to give the dish an extra depth of flavor. The savory flavors of roasted carrots and sweet onions compliments the creamy texture and flavor of the cashews. Vary it by adding roasted tomatoes or red pepper and garnish it with a tablespoon of sour cream and some of the cashews or with a small chile or some ssge leaves. Chop the carrots and onions into large, similar sized chunks, then toss them with the garlic, oil, and a little salt and pepper. Transfer to a pan and roast for 45 minutes. Place the cashews on another sheet, and roast them for about 5 minutes on a different rack. When the cashews are finished, allow them to cool. When the vegetables are done roasting, transfer them to a large soup pot along with all but 1/4 cup of the stock. Use the remaining stock to deglaze the roasting pan. Scrape all of the deliciously caramelized veggie juice from the pan and then pour them into the soup pot. 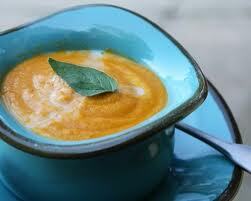 Bring the soup to a low boil, then reduce to a simmer and cook until the carrots become tender. This could take between 10 - 30 minutes. Using a food processor, pureee the cashews with 1/2 cup of the pureed soup. Puree until a smooth butter is formed, then transfer it back to the soup pot.